L 24″ (61 cm) W 41″ (104 cm). Description: Sexes similar. Flies with neck tightly coiled back. Plumage always all white. Breeding adult has long filamentous plumes down back ending and curving outwards near tail; shorter straighter plumes on nape and over breast; slender daggerlike black bill; legs black, feet yellow. Winter adult has shorter plumes, usually not apparent. Immature lacks plumes; has yellow stripe in back of black legs; yellow feet. 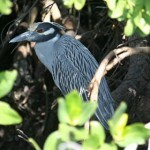 Non-breeding birds occur over a variety of habitats supporting fish. 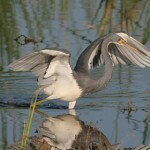 Habitat: Mostly associated with marshy habitat with emergent reeds and sedges. Where in Nebraska: Uncommon regular spring and fall migrant in eastern Nebraska. Becomming a rare migrant west. Uncommon regular summer visitor. Hypothetical breeder. 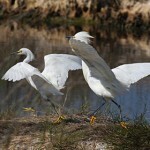 In Nebraska, good chance of observing the Snowy Egret in the Rainwater Basin in late summer. Status: Once extensively hunted for its plumes. Now protected, populations have recovered; range is expanding. 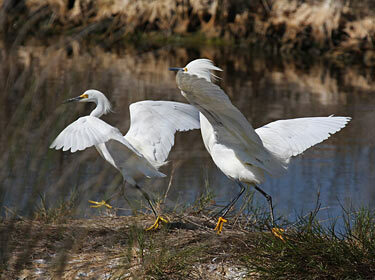 Fun Facts: While feeding in shallow areas of ponds and marshes, Snowy Egrets use one foot to stir up the bottom, flushing prey into view.